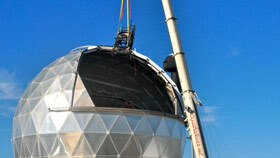 March 2011: The Hobby-Eberly Telescope is about to get a facelift. In the summer of 2011, engineers will lop off the package of mirrors, instruments, and electronics sitting 60 feet above its primary mirror and replace it with one that is heavier and more sophisticated. The replacement will give the giant telescope a wider yet sharper view of the sky and support a new set of powerful instruments that will allow it to begin probing the mystery of dark energy.